These four species often referred to as the big cats are easily recognisable species and can be seen in many zoos around the world. They have roaring as one of their common traits, in addition to all being top predators in their habitats. In the wild, the adults of all species live solitary, except for lions who live in prides, meeting-up only for mating. Lions are mostly associated with sub-Saharan savannah landscapes in Africa, although there is also a small population living in western India. The tiger is the world’s biggest living cat distributed in different Asian habitats from the tropics in south East Asia, to Russia in the north. Its range was once much larger than it is today. The smallest member of the big cats is the leopard which was once present all across Africa, the Arabian Peninsula and the Far East Caucasus. Nowadays, it has a very scattered distribution but still maintains a wide range in sub-Saharan Africa. The jaguar is the only big cat living in the New World with a range from Central America, down to the Amazon Basin and northern Argentina. There have also been a few recorded in the very south of the United States. Sightings of black and white offspring of certain Panthera species are highly sought-after. 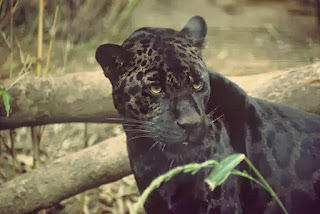 Melanism, a black pigmentation of the hairs, create the black coloured fur which can occur in jaguar and leopard species. In both, the rosette pattern is still visible, especially in good light (see image below). These variants are commonly referred as Black Panthers. White tigers have a white basic colouring of the fur but are not considered true albinos, because of the blue eye colour and black stripes. Recent taxonomic approaches based on molecular data, like that used by the Catalogue of Life’s parnter IUCN Red List, also include the snow leopard, Unica unica (Schreiber, 1775) in the genus Panthera as Panthera unica. All species are listed by IUCN Red list with the tiger as Endangered, the lion as Vulnerable and the status of leopard and jaguar as Near Threatened. Worse still some subspecies of tiger and leopard are Critically Endangered. Like other mammals, these species are provided by ITIS Global to the Catalogue of Life. The Catalogue of Life is Moving!